• The 10-day-readership programme aimed at making reading interesting for kids and inculcating reading habits among them. 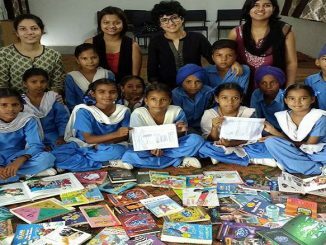 • The first step was to sort them as per their reading and comprehending abilities from level 1 to level 4. Level 1 children can interpret pictures but have difficulty in reading and writing. English/Hindi words or sentences. Level 2 includes students who can understand pictures and read, comprehend and write one liners in any language. Level 3 kids can read, write and comprehend mostly in Hindi and to some extent in English. As the level increases, a child’s ability to read complex sentences increases. Level 4 envelopes children who are fluent readers and can also write and comprehend well. The interns were assigned respective levels by the managers randomly for each intern was equally good and from there they dealt with their lots individually. • In the 10-day-program, the interns showed kids motivational and informative videos too to keep kids engaged in the session. 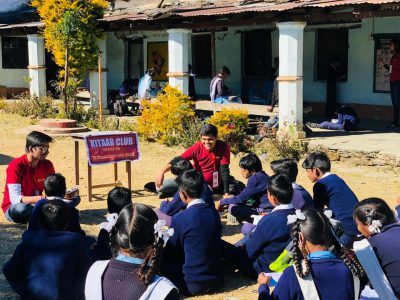 We also conducted a detailed session on “Good Touch Bad Touch” for level 1 to level 3 kids and “Menstrual Hygiene” for 6th, 7th and 8th class students, both boys and girls in addition to other social awareness sessions. The programme panned out exceptionally good. We left from Delhi on 18th December night and reached DEVIKHET around 9 the next morning and began with our programme from the same day itself. We conducted the programme in 2 nearby schools of Devikhet. One is the primary school Shri Timli Vidyapeeth, being efficiently run and maintained by Mr. Ashish Dabral wherein we were offered a total of 30 students right from LKG to 5th Standard. The other is the Government Intercollege headed by Mr. Sunil Chauhan. There we got an opportunity to teach and interact with 51 students from 6th, 7th and 8th standards. We were a team of 10 members comprising of 2 managers and 8 interns. The interns were divided into 2 groups of 4 members for each school with one manager supervising one school at a time, as was decided. 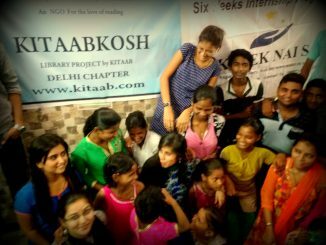 We had organised a day’s session into reading, writing and social awareness so that the interns could utilise the time efficiently with kids. Note: Level 1 consists of LKG, UKG and class 1 students. • We started the programme by conducting ice-breaking session first in the primary school where we gathered all students of the school and introduced ourselves to them turn by turn and asked them about themselves, why they loved reading, their likes-dislikes through various mini games to make them feel comfortable. The kids were welcoming but very shy to open up in the beginning. They began taking keen interest from the second half of the conversation. • Next the interns conducted ice breaking activities with them such as Zip Zap Zoop, An Animal Who… and the student who answered had to enact the voice of that particular animal, etc. Then we moved 4 interns to the government school as was decided. Hence, leaving behind 4 interns in the primary school for sorting kids and conducting a reading session with them along with proper supervision them from time to time. 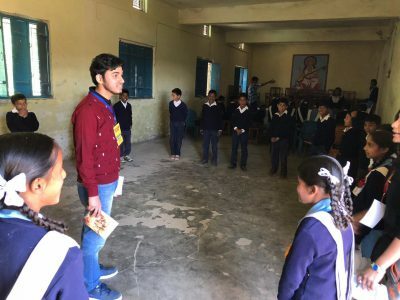 The 4 interns went with us and interacted with government school students and conducted some ice-breaking activities on the playground such as Fish in Fish Out, Headcount of One-two-three alternately in either languages, etc. in which they took part enthusiastically. 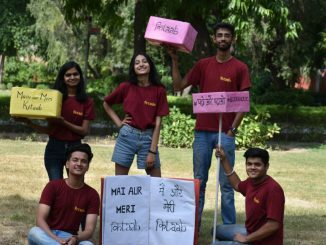 By then, they were comparatively more willing to sit for the session but one of the interns named Divyanshu also conducted a small Yoga session to relax them further. • Once we had successfully captured the students’ attention, we went on to grade them. The interns randomly took students and sorted them as per their reading, writing and comprehending levels. • Then the interns conducted a quick reading session followed by an activity, covered up social awareness topics like Traffic Signals, Global Warming, Pollution and homework distribution with which we wrapped up the first day’s session. The response was positive on the first day in both schools. • We reached both schools on time. The interns went to their respective classes for we had assigned them levels they would teach, last night after their consultation. 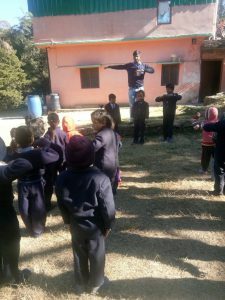 • There was a short introduction and the session commenced with homework assessment, followed by reading of the story, conduction of learning based activities like Hang Man, Clap-tap, Role Changes, Basic First Aid, etc. One of the interns named Aarshiya came up with “Correct The Word” activity which became the highlight of the day. It is a game in which a teacher writes 2 alternative spellings of a word with a slight difference on board and the students have to come and stand against the right spelling. It was so fun and enriching that later on almost all interns conducted this activity with their students on different days. • When primary kids had their recess, they began playing on their playground so we brought government school students to the primary school and then a movie named based on Gender Equality was screened. • Also, one more video based on Female Foeticide was shown to kids. The motive was to treach equal respect for both genders and break gender stereotypes among children. Surprisingly, there was an immense positive feedback about the topics dealt with and students actively participated in the session. Finally, the session ended with fun riddles and homework distribution to kids in both schools. • On the third day, we made some changes such as we had swapped interns. We were of the idea to provide all interns equal opportunities to teach different level kids in order to broaden their teaching experience. 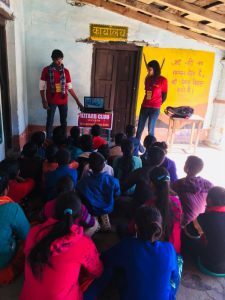 • Also, there was a combined session held for level 3 children (7th and 8th class students) where Raghav and 2 interns Aarshiya and Divyanshu talked about Science and its gift to Mankind covering topics like electricity, computer and technology. 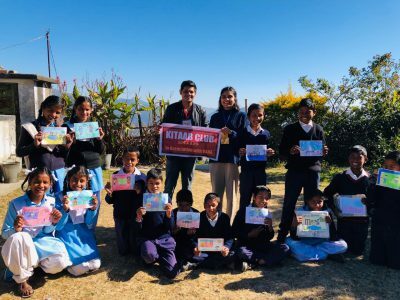 • There was a normal reading and writing session in primary school and the social awareness topic covered was Importance of Education, Child Labour and the Child Helpline Number 1098. This fruitful session was conducted by an intern named Devesh who screened a short video for the students to make them aware about their same. The kids found it quite relatable and interacted a lot during the session. • Then the interns played games with children for about half-an-hour and we left around 3:30pm. • We reached around 9:35am and the interns started with their normal sessions. In the primary school, interns taught Human Body Parts to level 0 kids through a video and delivered some amazing fun facts related to body parts. • A new game “Mathabola” was taught to level 1 kids by interns Divyanshi and Yatin. 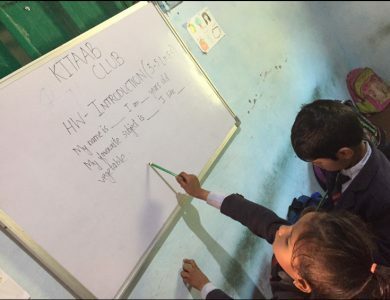 Level 2 students learned how to locate words in dictionary through a supported activity and level 3 children were made to work on their tenses to refine their English grammar. • Rest the normal session took place as usual. 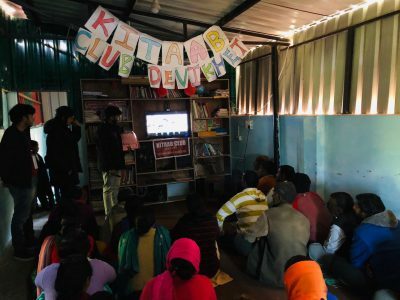 The social awareness topic undertaken was “Disaster Management” on which a video was shown to students. They were also briefly explained about the causes and preventive measures for Earthquake, Floods, Landslides, Cyclones and Forest Fires and then a Mock Drill in case of earthquake was conducted which was very successful. Overall, the session went magnificently well and we left around 3pm. • The entire team was excited for Swachh Bharat Abhiyan session today in both schools. All interns had done proper preparations to teach their kids regarding the topic. • There was normal session in the primary school. An intern Divyanshi took her kids to a small computer lab of the school where she taught them the shortcut keys, MS Word and briefed them about computer. 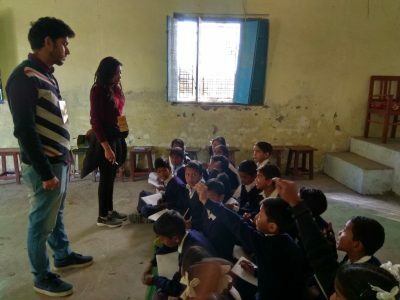 • The government school students had tests due to which interns had only 3 hours with them but they planned the session well by organising a combined reading and writing session instead of taking both separately followed by a Treasure Hunt prepared by intern Divyanshu based on all what was taught till now including the social topics covered for level 3 students. A local game called “Pithu” was also played with a little variation making it learning oriented. • Now came the most awaited session – Swachh Bharat Abhiyan session. 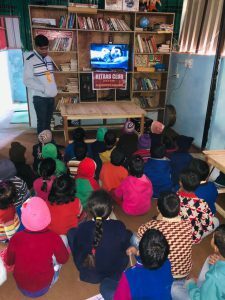 Students were familiarised about why, how and when the mission was initiated and by whom and short movies on Jaago Grahak Jaago, Hygiene and Cleanliness were shown. The kids were immensely interested in the movie. • This was followed by an interactive session where all interns explained to them about the rights of a consumer and the concepts of Biodegradable, Non-biodegradable, Landfills, Composting, Compost manure and its benefits. This was followed by Cleanliness Drives in both schools. A pit was also dug in primary school to which kids were made to dump biodegradable waste. • It was best day for us till now. The session had been a huge success with kids participating actively in large number and counter questioning every now and then. We were happy. The students were happy. 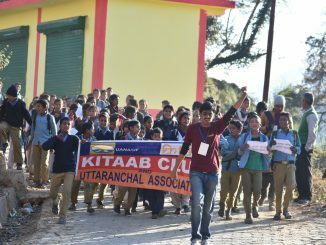 All were pumped up to keep the surroundings clean. • It was a busy day for interns. 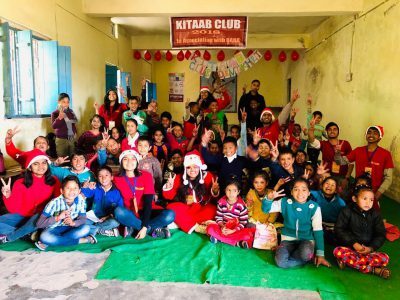 They were thoroughly engaged in briefing their kids about Christmas and making them rehearsed for tomorrow’s performances apart from their regular sessions. It was a great fun to watch interns competing with each other to put in their best to make tomorrow’s event a great success. Some were busy correcting Christmas speeches of their children, some were teaching dance to their students, some were engaged in making their kids Jingle-Bells and other poems with actions, others got involved in helping their kids to colour banners, prepare Christmas cards and drawings, etc. • The social topic covered was “Partition of India”. It was a combined session for level for 6th, 7th and 8th class students. 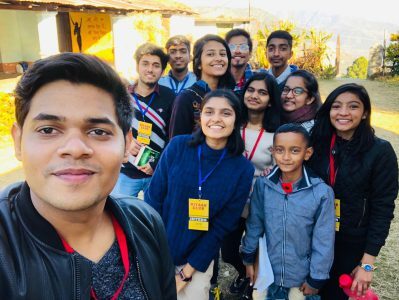 Divyanshu briefed them about the pre-independent and post-independent India. He was flawless. Aarshiya explained to them about States and Union territories, followed by Chandan who talked about Fundamental Rights and last was Devesh who threw light on Economic Growth. • The session was very effective as students asked questions and also corrected each other. The session ended with homework distribution and the last practice for the tomorrow’s celebration. • The Team had planned a Christmas Day Celebration for the kids. Everyone was enthusiastic. We reached the school one hour early i.e. 8:30 am and started with cleaning the podium and hall. Decorations were done. 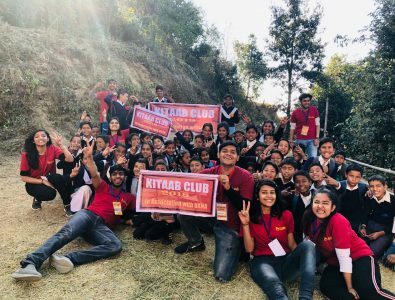 • Meanwhile, all kids from UKG to 8th were shown “Stuart Little” at Timli Vidyapeeth on the occasion of Christmas which was followed by a combined Christmas Day Celebration in the hall. • Students of both schools gave several performances. They showcased their dancing talents, sang melodious songs, recited beautiful poems with actions and gave captivating Christmas speeches. Everyone had a merry time. 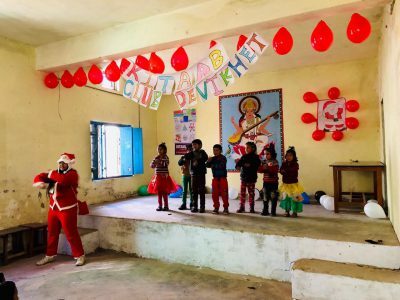 • All of us enjoyed and in the end, our Santa – Devanshi distributed chocolates to the loving kids and kids walked away with smiling faces. 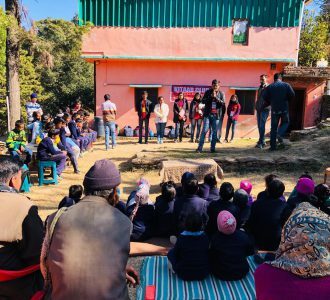 • Later on, the entire team along with the local coordinator went to a village nearby, named Bamoli and did a small survey about the education and its reach and impact on kids in that village. • After an overall analysis, we learnt that education has entered that village but there is still a long way to go. It would be great if Kitaab can work in that place too if possible. • The reached around 9:30 am and there was a regular session in the primary school. 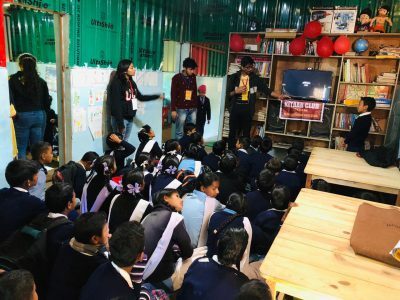 Kids were asked what they want to become in future and a goal-oriented session was conducted by interns Devanshi and Gagandeep after that a video based on human emotions was shown to kids in which a girl enacted the emotions and kids had to identify them. • They learnt about emotions of joy, sadness, anger, fear and disgust. This was done to inculcate empathy in them. A small video on team work was also shown to encourage unity among kids. • The government school students had their tests so the students came to interns after half time. A combined reading and writing session occurred. Also, the students were asked to prepare the front page and third page of their report cards. • The social awareness topic taken was “Mental illness”. It was discovered that many students did not know the meaning of the term itself. As a result, the interns explained to them about it in detail covering all aspects ranging from how to identify it and help someone were covered. It was an informative session. The session concluded with homework distribution and test remainder. • It was our last teaching day at the centre. 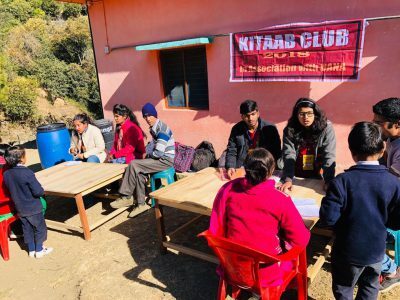 A test was conducted for an hour span for level 0 and level 1 kids to analyse how effective were these 8 days of teaching and other sessions to them. • Later on, the kids were shown video on “Good Touch and Bad Touch”. Kids were made to understand the difference between unhealthy touch and healthy touch. The day ended with a life lessons, mentoring and question-answer sessions along with a video on “Never Give Up” for primary kids. • A regular session was held for government school kids. Post lunch, they were brought to the primary school and a short video clip on “Adolescent Changes”, “Good Touch and Bad Touch” and “Menstrual Hygiene” followed by an interactive session was conducted. • Seeing that, the girls were not opening up, the boys were asked to move outside the room as a result the boy interns were asked to interact with the boys outside. Finally, the girls opened up with an intern Chandan. She briefed them about all important aspects related to the topics. The students were reminded to bring their parents tomorrow for Parent-teacher Meeting. • For the last day, we asked interns to prepare an overall analysis report card of their students on the basis of their performances in the past 9 days. 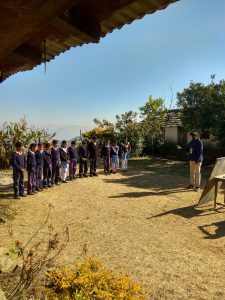 They were marked on their English and Hindi reading and writing, handwriting, attentiveness and graded on their discipline, questioning, punctuality, reaction towards social topics, etc. • Parent-teacher meeting was called upon to make parents know the strengths and weaknesses of their ward. Most parents turned up and all team members introduced themselves to the parents. • Later on, there was an interactive session where an effort was made to help them realise the importance of treating the child the right way. A video was shown on Child Labour to explain the importance of education to them. • Also, a very emotional video on Migration was shown followed by the Parent-teaching Meeting. The meeting with parent were very effective as the interns brought to their notice some very serious issues like the library problem, paper leaking, etc. 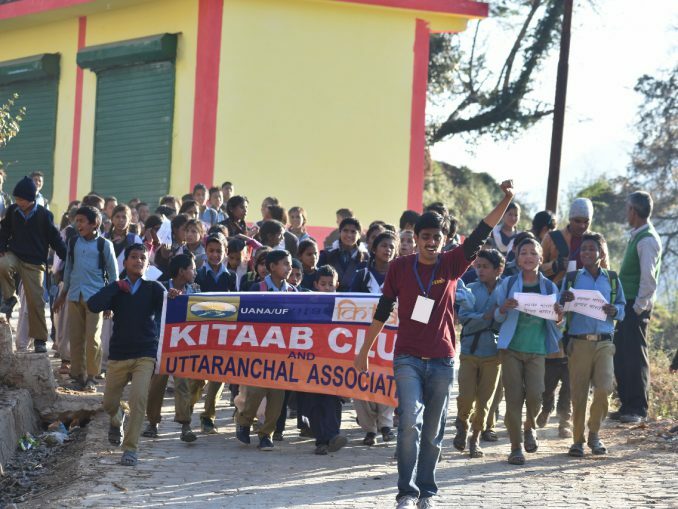 occurring in the government school along with the overall analysis of the students. We handed over the whole carton of books given by Kitaab Club for Devikhet centre to Ashish Sir at Shri Timli Vidyapeeth and did not give a single book to The Government Intercollege due to the same reasons. The day ended with filling of feedback forms by the students of both schools and teachers of Timli Vidyapeeth. Interns played a few games with their kids and bid farewell to them with tears. • In our point of view, there is a large scope for improvement in Devikhet centre. No doubt, kids of both the schools are bright and talented having a lot of potential to do better. They are full of creative and imaginative skills in spite of the limited amenities they have. All they require is proper guidance and a little push which is provided at a satisfactory level in Shri Timli Vidyapeeth but the case with the Government Intercollege is quite opposite. • The condition of the library established by Kitaab last summer in government school is deplorable. Books which Kitaab Club gave then are traceless now. The government school staff was also less cooperative. There were times when we got government school students for about an hour despite the full 6 hours that was agreed upon. • Much to our surprise, we discovered liquor drinking and paper leaking practices being followed in the government school by teachers. Parents were unaware about the same. We tried informing them about these problems to the best of our potentials during Parent-teacher meeting. • These were the major issues we faced. 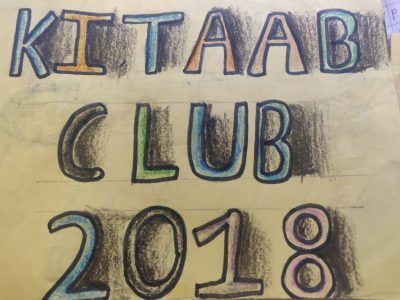 It would be beneficial for Kitaab Club if the next team which goes suitably deals with these issues. 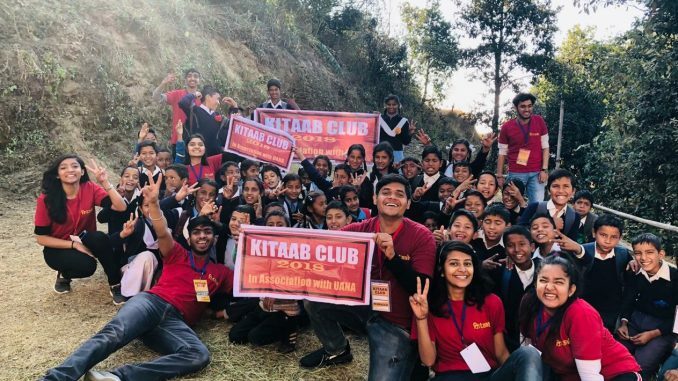 Nevertheless, kids there have developed a special bond with Kitaab Club and eagerly wait for its next readership programme. • Not to one’s surprise, this 10-day-readership programme was a great learning experience for us. Every time we go, it is a new feeling. 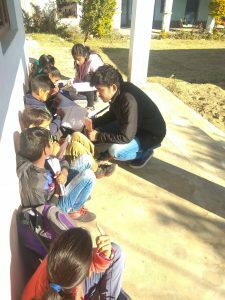 We discover so much about the place, get to know education system at its roots and feel motivated to see that in spite of several hardships faced by locals, they love their place a lot. 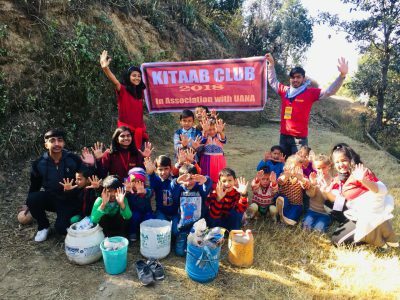 Same as we love Kitaab Club and feel satisfied that we are doing something good “for the love of reading”.